LIGHT WEIGHT: It is easy to carry and does not affects user experience. One can play for hours without feeling any irritation. PLASTIC BODY: Plastic body gives it a unique sleek look and makes it light weight. COMPACT: The headset portability is further enhanced as it easily folds down to a smaller size. The ear cups do not rotate and the whole gadget fits into all kinds of small backpack pouches. EARCUPS: Just like H5, they are soft and optimized for the comfort of the gamer. MICROPHONE: The microphone handles background noise good without having to use any software though with the software the sound could be improved. But sound quality is pretty amazing. Why add H3 to your list? Why NOT add H3 to your list? 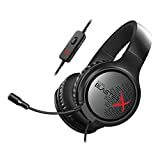 The Creative Sound BlasterX H3 is a very well made gaming headset, Creative have done a fantastic job developing and engineering a master piece of a headset with high quality audio.